Employee Giving Campaign final celebration is March 25th at 6pm! State48 shirts are in! Stop by the Foundation or the Topping Off Party to receive a shirt. Thanks to a generous donation by Papa John's there will be FREE PIZZA at 6pm on March 25th at the Open House in the new parking garage (look on the west side). Thanks to McCarthy Construction for hosting us! Don't forget! All pledge card returns will be MATCHED by a can of food to the food drive -thanks to Corporate Donors Techline Services and Rayhons Financial. Food drive continues with Nutrition Services until March 31st! Participation drawing winners include: Donald Clark, technician at Mesa Arizona General, Lisa Zimmerman, Materials Management Coordinator at Chandler Regional, and Lori Brown, EEG tech in Cardiac Services at Mercy Gilbert all receiving Starbucks gift cards. And, Emily Bydlon a surgery tech at Chandler gets the Sonos home sound speakers. Pillips Mosiuk, RN in surgery at Chandler has the weekend Drive from Earnhardt Ford, Danielle Tirk, RN at MGMC has the 20 person Zoyo party, and Carol Jo a Phamaricst at Chandler received the Uber Gift Card. And... the teams that are lucky at MGMC at CRMC are 4A MedSurg because they know Lisa Miller; and MedSurg Chandler because they know Kim Cammiso. Both teams will have a PapaJohn's pizza party in honor of their participation in this year's campaign. Making a gift during the Employee Giving Campaign is easy and convenient! Donate one time on line now, or to give either a one-time gift or an ongoing recurring gift using payroll or PTO deduction go to the Employee Self Services System (ESS). EVERY GIFT MATTERS and your gift will give your department one entry into a drawing for a Papa John's Pizza Party. Learn how your dollars are invested, walk through how to give on-line, and more - stop by the information booths on: February 28th and March 15th. 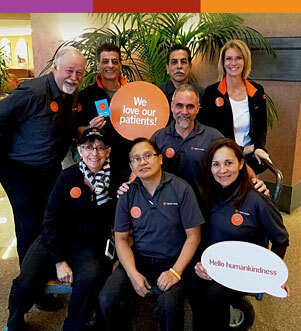 Dignity Health enjoys a proud legacy of employee philanthropy and we are honored that so many of our caregivers and their families choose to make our Foundation one of their annual giving priorities. Through a tax-deductible gift to the Dignity Health Foundation - East Valley, employees help to ensure that the same quality of care they deliver every day will be available to their loved ones in their time of need. IMPORTANT NOTE: By signing up for a payroll deduction, you understand that any ongoing donation election will be in effect until discontinuance is requested by you in writing or by on-line request through the ESS system. As a fun twist to National Nutrition Month, the folks at the East Valley Foundation are teaming up with Nutrition Services to hold a Canned Food Drive. Food Drive boxes can be found at all Dignity Health facilities throughout the Valley, including Urgent Care centers and Arizona General Hospital. Call 480.728.3931. Every employee donation (of any denomination) using a Dignity Rising Employee Giving Brochure will be matched with a canned food item by Foundation corporate partners Tekline Services and Rayhons Financial- up to 1,000 cans! Dignity Rising Employee Giving Brochures can be submitted at cafeteria registers or hospital gift shops. Pledge form matching ends March 15th so please submit your Dignity Rising Employee Giving Brochure soon! March 1st-31st Donation Box Dropoff - Donation boxes are located in cafeterias and throughout all Dignity Health facilities. March 6th Lunch and Learn “Smart Snacking” (Noon-1:00 p.m.) - Learn how to make healthy snack choices from CRH dieticians. Available on the lower level in the cafeteria. March 13th Registered Dietician and Nutritionist Day - Bring a can of green veggies to the cafeteria and receive a free special cookie! March 15th Free ZOYO Yogurt (11:00 am-2:00 p.m.) - Complimentary frozen yogurt for anyone bringing cans or Dignity Rising Employee Giving Brochures. Located near Café Kindness at CRMC and the gift shop at MGMC. March 20th - Bring a can of fruit to the cafeteria and sample a free fruit based treat. March 27th - Bring a non-perishable food donation to the cafeteria and receive a free beverage (details in the cafeteria). Let’s raise as many donations as we can to support the expansion of health care in the East Valley and fulfill our mission of compassion by feeding the hungry! 100% of employee pledges and donated food will be put to work in your hospital and community through AZCEND and Matthew’s Crossing Food Banks.